This Guide provides a budget deck for all classes for you to play around with and start competing with in Shadowverse. To quickly add the contents of the decklist to your deck in Shadowverse, click on the link. 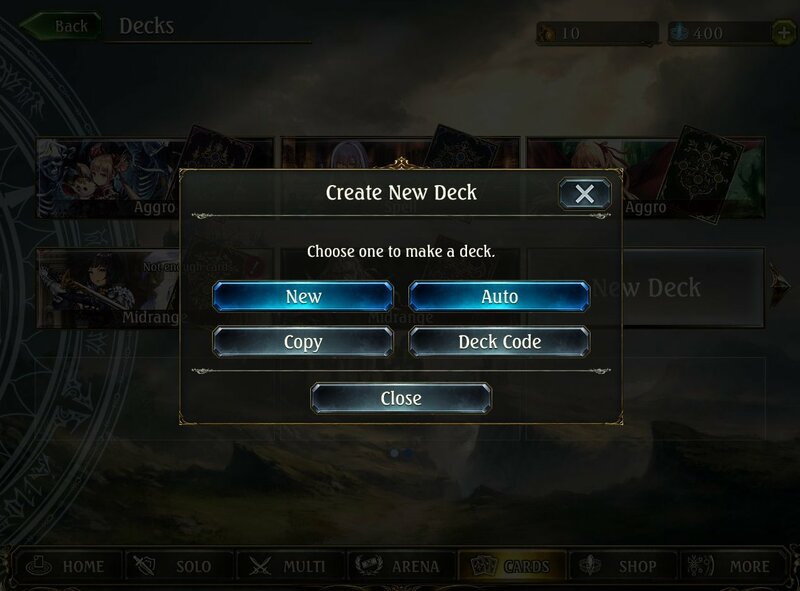 This will take you to its Shadowverse Portal page, where you find a button "Create Deckcode". 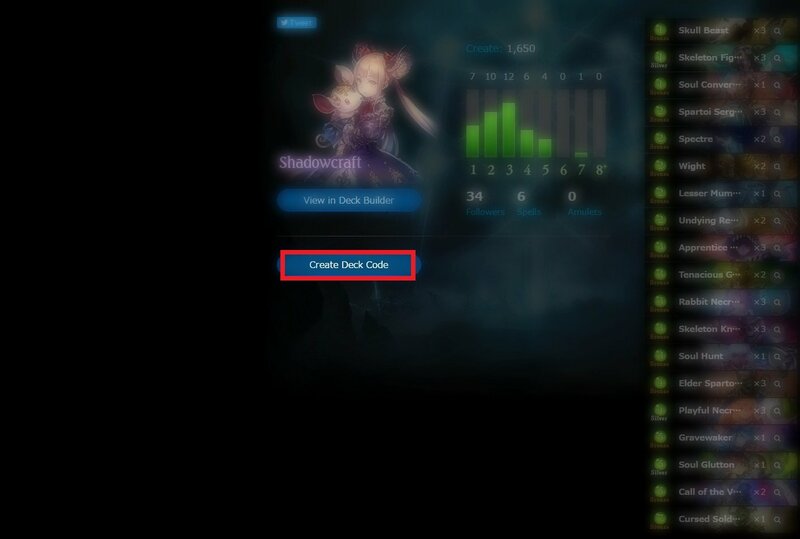 Clicking this button will give you a Deckcode which you can use if you select Deck Code when you create a new Deck. This Forestcraft deck focuses on gaining an early board advantage through a combination of cheap followers, removal and the "If you played at least 2 cards this turn"-effects. The main goal of this deck is to flood the board, remove enemy threats while also playing followers (using Rose Gardener and Archer for example), and finishing by buffing up your board with Blessed Fairy Dancer. You want to mulligan for cheap followers, in particular cheap followers that add Fairies to your hand (like Water Fairy, Fairy Circle or Fairy Whisperer). Then you want to fill the board with followers, but try to keep at least 1 fairy in your hand at all times. This makes it easier to trigger the "If at least 2 other cards were played this turn"-effects. Try to play normal followers instead. When the enemy plays followers, remove them using Elf Metallurgist, Sylvan Justice or Pixie Mischief. The ideal scenario would be playing Archer, followed by a couple of Fairies. This not only builds a board for you, the Archers effect will also deal damage to the enemy board. During the midgame you want to finish your opponent by playing Blessed Fairy Dancer while you have a couple of followers on the board. If the enemy plays huge threats you can remove them by evolving your Rose Gardener. This Swordcraft deck focuses on gaining an early board advantage through a combination of cheap followers and followers who have the ability to buff other followers. The main goal of this deck is to flood the board, buffing your followers using cards like Fencer and White General and then finishing by playing Sage Commander while you have a couple of followers on the board. You want to mulligan for 1-cost followers (preferably Kunoichi Trainee or Vanguard) and 2-cost followers that buff said 1-cost followers (Princess Vanguard or Palace Fencer). Build up the board by playing cheap Officers and buff them by playing Commanders. This will allow you to trade your cheap Officers for powerful enemy 2- or 3-cost followers. Further fill your board by playing Ascetic Knight and Pompous Princess or by evolving your Floral Fencer. When the enemy starts to play huge threats, remove them by evolving your Swordsman. Your goal now should be to have 4 followers on the board, and then finish by playing Sage Commander and attacking the enemy leader. This Runecraft deck focuses on clearing the board by using your many removal tools, while also building up a big powerful hand with your Spellboost. The main goal of this deck is to play removal to prevent damage to your leader, while simultaneously boosting the power of your spells with Spellboost. Your win condition with this deck is using Flame Destroyers in combination with Dimension Shift to deal crazy damage and OTK your opponent. You want to mulligan for cheap cards that either offer board presence (like Angelic Sniper or Windblast, Magic Missile or Conjure Golem) or cards that provide card draw (like Sammy, Wizard's Apprentice or Insight). Try to build up a big hand, preferably containing one Dimension Shift, one Flame Destroyer and a couple of removal spells. Play and Evolve your Spectral Wizard when you have a hand with a lot of spells or use Sorcery Cache to either boost the power of Fire Chain and Windblast or to make your Dimension Shift cheaper. Wait until you can play multiple Flame Destroyer and Dimension Shift in one turn. Then use your next turn to attack the enemy leader while also playing another Dimension Shift. Alternatively, you can wait until you can two Flame Destroyers and one Dimension Shift. This allows you to deal 14 damage, while also having another turn which you can spend on stabilizing the board by removing big threats using Fiery Embrace or building up a board using Summon Snowmen (If the Fire Destroyer+Dimension Shift combo wasn't enough). This Dragoncraft deck focuses on ramping up your Play Points while also contesting your opponents board early. The main goal of this deck is to reach Overflow as soon as possible, using your extra Play Points to play more powerful followers than your opponent. In the Late Game, it will be hard for your opponent to compete with your powerful high-cost followers. You want to mulligan for cheap cards that contest your opponents board early on (like Blazing Breath or Fire Lizard) or cards that help you ramp up your Play Points (like Aiela, Dragon Knight or Dragon Oracle). Use removal or cheap followers to destroy enemy followers while also trying to play Ramp cards like Aiela or Dragon Oracle. Your goal for the early and midgame is to reach Overflow as soon as possible, since it will not only allow you to play big threats earlier than your opponent, it will also boost a lot of your cards. When you reach Overflow, play powerful Followers that will not only build a strong board for you, but also remove opponents threats (like Dread Dragon or Glacial Dragon). You can also deploy Dragon Guards to protect your leader. If your opponent play big threats himself you can utilize Serpent Wrath or Conflagration to remove them. When your board is much stronger than your opponents board, you can stop trading and hit the enemy leader to finish the game. This Shadowcraft deck focuses on taking over the board early using cheap followers while also generating Shadows to empower cards like Apprentice Necromancer, Call of the Void and Lesser Mummy. The main goal of this deck is to overwhelm the opponent early with powerful early followers, forcing the opponent to trade their followers with yours while you attack their leader. If rushing the enemy leader with your followers isnt enough, you can use Evolved Lesser Mummy or Cursed Soldier as finishers. You want to mulligan for cheap followers, preferably cheap followers that generate Shadows (like Skull Beast or Spartoi Sergeant. Around Turn 3 you want to play Skeleton Knights or Rabbit Necromancers to deal damage to your opponents leader or to bait out removal. When you have a big board you can play Wight while trading some followers, to clear out their board while simultaneously dealing damage to the opponents leader. If you opponent plays big threats you can use followers with Bane (like Spectre or Soul Glutton) or removal spells (like Undying Resentment, Soul Hunt or Call of the Void) to remove them. Use your Evolved Playful Necromancers and Apprentice Necromancers to fill your board to trade or deal more damage to the opponents face. If all of this isn't enough to kill your opponent, you can use your Cursed Soldier's Fanfare or Lesser Mummy to finish the job. This Bloodcraft deck focuses on taking over the board early using cheap followers while also damaging yourself to gain benefits from the effect of Succubus. The main goal of this deck is to overwhelm the opponent early with powerful early followers, forcing the opponent to trade their followers with yours while you attack their leader. If rushing the enemy leader with your followers isnt enough, you can use Alucard or Dark Generals to finish the job. You want to mulligan for cheap followers and/or cheap cards that damage your opponents leader (like Ambling Wraith or Bloodfed Flowerbed). Keep playing followers to fill your board and keep attacking the enemy leader while also removing threats using Razory Claw. If your leader's defense is even or lower than the opponent's leader's defense, play Succubus in order to acquire more damage to your opponent. If your opponent plays big threats use Evolved Wardrobe Raiders, Demonic Strikes or Demonic Storms to remove them. Alternatively, if the opponent doesn't play big threats during the first four turns, you can use your Demonic Strikes and Razory Claws to deal more damage to the opponents leader. If this isn't enough, you can use your Alucards or Dark Generals to finish the job. This Havencraft deck focuses on clearing the board by using your many removal tools, while also playing powerful Countdown Amulets to establish a board and playing Ward followers and Healing followers to protect your leader's remaining Defense. The main goal of this deck is to play removal to prevent damage to your leader, while simultaneously playing powerful Countdown Amulets to gain followers on your side of the board. Your win condition with this deck is playing powerful Ward followers and Lucifer to protect your leader while you play Prince of Darkness to gain access to the powerful Apocalypse Deck. The Apocalypse Deck offers powerful options to finally finish your opponent. You want to mulligan for cheap Amulets (like Sacred Plea or Beastcall Aria), removal (like Blackened Scripture) or Hallowed Dogma to speed up your Amulets. Play followers with Ward (like Temple Defender) or followers that heal (like Unicorn Dancer Unica) to protect your leader. After that, keep removing your opponents board by using your many removal options (like Evolved Priest of the Cudgel, Execution or Acolyte's Light) You can also play removal amulets so the opponent will hesitate to play followers (like Death Sentence or Forbidden Ritual). After that play big Ward followers and/or Lucifer to protect your leader while you try to finish their leader. If this isn't enough play Prince of Darkness to gain access to the powerful Apocalypse Deck. This Deck has more than enough options to kill your opponent or wipe their board. Astaroth's Reckoning allows you to finish drop your opponent from full health to 1, while Silent Rider and Dis's Damnation can be used to recover the board or finish the job.